Note: Limited scholarships available for community volunteers. Register: Complete attached training application and return to agewell@ptrc.org. 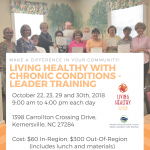 Contact: Please contact MaryLou White (agewell@ptrc.org or 336-904-0300) for more information.